Kapaa is located on the east side of Kauai and is known for its collection of shops and restaurants - a favorite spot being the Kinipopo Shopping Village. Water sports like water skiing and kayaking are also popular in Kapaa. 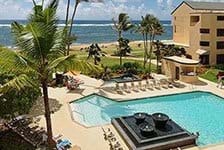 Book a stay at any of our beachfront Kapaa hotels and enjoy your stay on Kauai.